Kids With a Cause | Features | Kids VT - small people, big ideas! Elese Snay, a senior at Milton High School, has always wanted her dad to quit smoking, but until she joined Our Voices Xposed, the state's antitobacco youth program, last summer, she wasn't sure she had the tools to convince him. Last November, Snay joined more than 70 kids from around northern Vermont at the annual youth summit for OVX and its middle school equivalent, Vermont Kids Against Tobacco, at the DoubleTree Hotel in Burlington. Many of these kids, who spent the day learning to deliver their message to the media, have personal connections to the cause — their parents smoke, or their grandparents died of lung cancer. "Every kid has a right to breathe clean air," said Gabbi, a student at St. Albans City School, referring to the program's Free My Ride campaign to keep secondhand smoke out of cars. Milton Middle Schooler Megan was psyched to get her message out. "I like to give back to the world," she said. "I want everyone to be healthy." According to students at Enosburg Falls High School, the biggest health threat facing their classmates isn't drugs, alcohol or even cigarettes. It's chewing tobacco. Kids aren't allowed to drink or smoke at school, but some go to class with chew in their mouths and carry around containers to use as spittoons. "Last year, there were so many kids that would just walk around with a bottle in their pocket, and they would, like, do it during class, when the teacher wasn't looking," says 11th grader Natalie Jackson. On a school field trip last year, 11th grader Kylie Bryce says she woke up from a nap on the bus to find chew spit on her blanket. In rural Franklin County, says guidance counselor Sandra Brauer, chew is "a rite of passage for the guys. It's traditional; it happens in their families." Its prevalence at the school has been "disgusting," she says. And harmful — chewing tobacco can lead to tooth decay, gum disease, heart disease and various types of oral cancer, according to the Mayo Clinic. And because chew contains nicotine, kids get addicted to it. A few years ago, it was so ubiquitous, Brauer says, "You'd walk down the hallway or up the stairs and there was spit all over the place." And teachers were ignoring the problem. Eleventh grader Hannah Johnson found it harder to ignore. "My family members and my friends chew, and it can hurt them," she says. "I would rather not see them with cancer, because I care about them." So Hannah and her friends, including Natalie and Kylie, decided to take action. The three teens are among a dozen students who are active in the Enosburg Falls chapter of Our Voices Xposed, the state's high school antitobacco program. The EFHS group meets once a month to engage in hands-on projects aimed at convincing kids and community members to stop using tobacco products. Over the past few years, EFHS students have helped create smoke-free zones in town; they ran a successful community postcard drive, conducted research and lobbied the high school faculty. Those efforts are not only paying off in substantive changes, they're fostering leadership and advocacy skills among the kids. About 400 youngsters across the state are involved with OVX and its middle school equivalent, Vermont Kids Against Tobacco. Both efforts were established by the Vermont Department of Health: VKAT in 1995; OVX in 2001. Fifteen high schools currently have OVX chapters. It's an apt time to evaluate youth tobacco use. This year marks the 50th anniversary of the surgeon general's landmark report that linked smoking to lung cancer. And a new report from the current surgeon general has revealed some chilling new findings. "Smoking really is even worse than we knew," Thomas Frieden, director of the Centers for Disease Control and Prevention, told NPR's "Morning Edition" last month. Cigarettes have now been proven to cause diabetes, colorectal and liver cancer, rheumatoid arthritis, erectile dysfunction, impaired fertility, and immune-system weakness. They can even cause stroke in nonsmokers exposed to secondhand smoke. "If we don't act now, 5.6 million of our children will be killed by tobacco," Frieden said. The OVX kids have their work cut out for them. On a recent weekday afternoon, a dozen Enosburg Falls OVX teens sat down with several boxes of pizza to evaluate the prevalence of smoking, and chewing, where they live: Franklin County. Amy Brewer, a health educator from Northwestern Medical Center and a longtime collaborator with the group, brought copies of the recently released 2013 Youth Risk Behavior Survey. Every two years since 1993, the survey has asked middle and high school students about behaviors such as tobacco and drug use, alcohol consumption, and sexual activity. The results suggest that the health department's antitobacco efforts are making a difference. In 1999, 54 percent of Vermont high school students reported having smoked a whole cigarette. In 2013, only 24 percent said they had. But the rates in Franklin County are still relatively high. Eleventh grader Haley Thompson speculates that's because "our town is in such a rural area, it's what teenagers rely on to keep them busy." At the meeting, Brewer asked the kids to read through the results and identify their county's strengths and weaknesses. The kids were shocked to learn that 14 percent of Franklin County students said they smoked a whole cigarette before age 13 — twice the state average. They were also surprised to read that 20 percent of Franklin County students who smoked in the 30 days before taking the survey had bought their own cigarettes. Seventy-four percent of Franklin County youth responded they thought it "would be easy to get cigarettes." Brauer, the group's faculty adviser, noted, "A lot of students just go in and buy them." The kids continued through the survey, reading the results out loud. In category after category, their county lagged the rest of the state. One survey question asked students if they believe that a majority of high school students smoke cigarettes — 23 percent said yes. "Do they have a question like that for chew?" Kylie asked. "Because a lot of people think everybody does that here." The most recent survey doesn't have that question, but Brewer said she'd take the suggestion to the health department. The EFHS kids' focus on chew began a few years ago when they invited a dentist from South Hero to talk to them about its harmful effects. In an effort to find out how many kids were actually using the stuff, "Every time they saw a circle in the pocket or a wad in the mouth, they'd make a note," said Brewer. The kids compiled their findings — which revealed that dip was indeed prevalent in the school — and took them to a faculty meeting. Since then, awareness of the chew problem at the school has grown. Last fall, the OVX group launched its latest campaign: to get local doctors and dentists to talk to all of their young patients about the dangers of chewing tobacco. Under the guidance of another adult, Sarah Jo Willey, who runs the business leadership program at nearby Cold Hollow Career Center, they created a short video appeal they plan to send to medical professionals in their community. "Dentists and doctors are trusted," 12th grader Bella Carter explained. "You want the people who are taking care of you to care about you." The student population in Enosburg Falls has turned over twice since the high school got involved in antitobacco advocacy, so the current crop of OVXers has a reputation to maintain. The biggest accomplishment of its predecessors: two smoke-free parks in town. Back in 2008, OVX students spent an afternoon picking up trash at Lincoln Park, which is adjacent to the school. "Within 20 minutes, the kids picked up — I can still remember the number — 1827 cigarettes," said Brauer. "Tobacco outweighed the other trash by huge proportions." Motivated by their findings, the group visited Enosburg Falls' annual Vermont Dairy Festival to conduct a survey. They wanted to know if people would support a smoke-free park; more than 80 percent said they would. The kids presented their survey results to the town and, by the end of the school year, both Lincoln and Maple parks were officially declared smoke-free. "It was really empowering," recalled Brauer. A more recent community campaign involved the local Hannaford supermarket, whose smokeless tobacco products are visible in a display case near the checkout aisles —at eye level with small children. OVX kids did their research and learned that according to tobacco-control standards, such products should be displayed more than three feet off the ground. They invited the store manager, Chris Chagnon, to come speak with them. Then, with his encouragement, they launched a community postcard campaign. They collected 700 postcards — each with a unique message from community members explaining why they didn't want tobacco products displayed where children could see them — which they sent to Hannaford corporate headquarters. Before the kids could follow up with the representative there, said Brewer, they learned she had already called Chagnon and talked to him about redesigning the display. "I got a call from someone at our corporate office, who was very pleased with the initiative they took," he says. The redesign has yet to happen, but the kids are hopeful it will soon. Chagnon was impressed with the group's tenacity. "I think it's great when you can get a group of kids who are willing to take a stand," he said. "Especially knowing that they're going up against a big company, as opposed to some of the smaller, individually owned stores. These kids had the enthusiasm and put themselves out there." 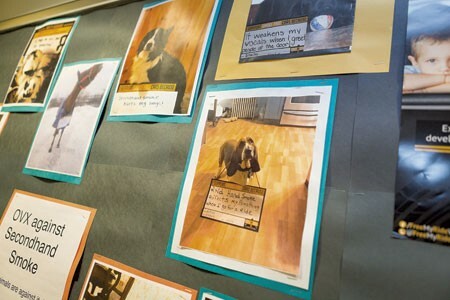 The OVX kids recently finished another, more lighthearted project: a series of posters featuring photographs of their pets sitting next to slogans such as "Secondhand smoke makes me feel 'ruff.'" At their recent meeting, they brainstormed names of local businesses that would hang the posters. Sarah Jo Willey encouraged them to reach out directly to business owners. If they asked the owner of Bates Farm Home & Garden, for example, he might agree to let them staple the small posters to bags. "You have a tremendous opportunity to demonstrate your leadership in this community, challenging adults to think differently," Willey told the kids. "It's something you can do way better than we can." Though individual schools run OVX chapters, they rely on outside financial support to keep the groups going. The Vermont Department of Health created OVX shortly after the major tobacco companies agreed to pay a $200 billion settlement to states to recover their tobacco-related health care costs, and to fund efforts to prevent kids from picking up the habit. Vermont's settlement funds went toward the formation of several community coalitions to prevent alcohol, tobacco and drug use. But a separate $1.5 million grant from the American Legacy Foundation — which was established with settlement funds — went toward the creation of OVX, according to Rhonda Williams, a chronic disease prevention chief with the health department. Since then, the youth program has received additional funding from the Centers for Disease Control and Prevention. The original goal for OVX was simple: Provide opportunities for kids to learn the truth about tobacco advertising. Young folks should understand that they're being played, Williams said, that the tobacco industry sees new smokers as replacements for older ones who have died. "That's a powerful kernel of truth to expose to Vermont youth," Williams said. Still, the future of OVX's funding is uncertain. "We're toward the end of a five-year cycle with our CDC funds, and it's unclear what it will exactly look like when we're invited to apply for more funding," says Williams, who wants to see the program continue. "Evidence certainly points to the fact that tobacco-control programs, if they are adequately funded, do have a positive impact on reduction." According to the Youth Risk Behavior Survey, the OVX anti-chew efforts appear to be paying off; just 12 percent of Franklin County high school students reported using chew in the past 30 days, down from 16 percent in 2011. That was an exciting find for the kids. Noted Bella Carter, "You can actually see the change happening." Get involved with OVX: Visit ovx.org/get-involved-ovx to join an existing group or learn how to start your own. To connect with VKAT, visit govkat.org.